Homemade bath salts are one of my favorite easy homemade gift ideas. They are fun to make and easy to make beautiful! To make your bath recipes beautiful, simply find gorgeous glass containers and wrap stylish ribbon, raffia or craft cord around them along with a homemade gift tag. To ensure that your bath recipes make thrifty homemade gift ideas, you can up-cycle glass jars or shop at thrift stores and yard sales. Bath recipes can be as simple as combining a couple dry ingredients or they can be much more complicated, so start with a recipe you are comfortable with. ...With that in mind, here's a few easy bath recipes you can start with! The first time I made bath salts was for baby shower favors. They made incredibly affordable favors plus they looked gorgeous in a set of triangle jars I had found at a yard sale. 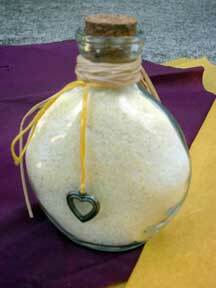 I used the easy bath salt recipe below and made 3 different scented/colored bath salts to fill my jars. Using just salt and essential oil is certainly a very basic bath salt recipe. The fact that it turns out great every time is just a bonus. Also provided are alternative scent ideas. It's easy to alter this recipe from lavender to another scent. Rejuvenating Mint Bath Salt Recipe with Mustard Seed. Once tried - all are hooked. This is a great pick-me-up bath mixture and it also can be used for soaking tired feet. It actually makes you feel better. Homemade bath salts are simple to make. They can be color tinted, scented or plain. They can be presented in a jar or a cellophane bag. They can be given as one small gift or paired up in a gift basket. Epsom Salt. Epsom salt makes a great cleansing bath for removing toxins, providing relaxation and relieving aching muscles. You'll find Epsom salt in just about every grocery, health or pharmaceutical store, usually in the personal care sections. Sea Salt. 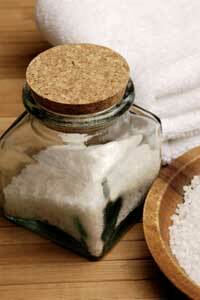 Sea salt has the same cleansing and relaxation qualities of Epsom salt plus lots of minerals. Although salt is a wonderful bath product all by itself, a variety of therapeutic ingredients can be added for more health, healing and relaxation benefits. For example, you can infuse bath salts with scent, color and oils. These are just a few of the most common ideas for bath salt recipes. You may also be interested in learning How to Make Bath Powder. Here you'll find recipes for using essential oils, fragrance or perfume to make a custom bath powder. Bath powder can be given as an individual small gift or as a set with other complimentary bath products such as the homemade bath salts above. For a fantastic homemade gift, put together a bottle of homemade massage oil with a coupon for a massage (either make a gift certificate for a massage by you or buy a professional massage certificate, depending on your relationship with your gift recipient). Homemade massage oil is incredibly easy to make and if you make it yourself, you can choose the scent and the quality of the ingredients. I prefer a mix of sweet almond and grapeseed oil for my massage base. I always mix in about 1/2 teaspoon vitamin E oil per cup (handy trick... you can always break open vitamin E capsules for this) for the incredible health benefits for your skin. Another great thing to do with essential oils is to make an aromatic spray. A homemade aromatic spray would make a wonderful homemade gift either by itself or in combination with a couple other homemade bath recipes. It's easy to make an amazing aromatic bath, body, linen, room or perfume spray. Simply find a beautiful glass spray bottle and fill it with distilled water and a pleasing amount of essential oil. Depending on the essential oils you use, you can give this homemade gift labeled as a body spray, a linen spray or a room spray. How to Make Rose Water. Homemade rose water is a natural toner, a fragrant body spray, a romantic addition to the bath and a high quality addition to many bath recipes. Homemade Herb Wreath. A gorgeous rewarding way to use up extra herbs from the garden. Herb wreathes make a thoughtful gift for friends and neighbors. The herbs can also be plucked as needed for use in cooking. 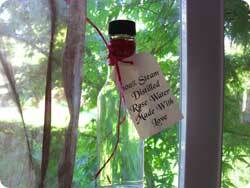 Homemade rose water is one of the most amazing things I've made... and I love sharing it for homemade gifts! 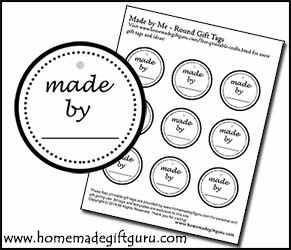 PERFECT printable gift tags JUST for homemade gifts!